You are browsing the archive for #planning. in addition to the core, at least some other members join – for Fri/Sat or both. We are at some location 30-60 minutes drive from Helsinki center. Probably one of the spots coordinated/recommended by the Scouts. OKFFI will bear the travel costs of all core members, board members, OKFFI employees and named representatives. If your thematic group core member cannot attend, please appoint another person. BUT, we encourage others to join as well! Food, accomodation, etc. available at a reasonable rate, please ask for details. You CAN apply for some assistance from working group or association budgets. We are trying to be as inclusive as possible. More details coming up soon. Contact: teemu.ropponen@okf.fi The post Welcome to the Open Knowledge Finland planning retreat on Nov 11-12 appeared first on Open Knowledge Finland. At the Open Knowledge Foundation, we aspire to create environments that connect diverse audiences, thus enabling a diverse groups of thinkers, makers and activists to come together and collaborate to effect change. This year, the Open Knowledge Festival is fuelled by our theory that change happens when you bring together knowledge – which informs change - tools – which enable change – and society – which effects change. Whether you’re building better, cooler tech, creating stronger ideas for the open movement or aiming to shift the gears of society, this year’s OKFestival is the place for you; a place of diverse interests and learning experiences, highlighted by this year’s emphasis on collaboration across these three streams. 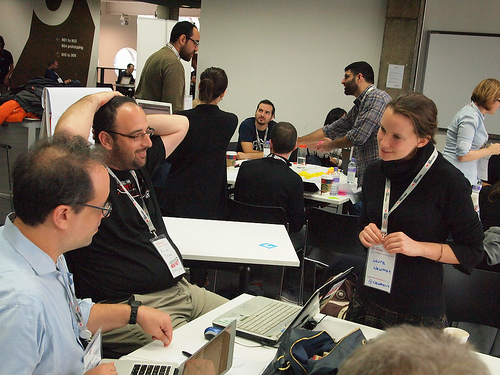 In the past, Open Knowledge Foundation events have been organised around topical streams. This has enabled us to grow the movement across communities as diverse as science, transparency, development and linguistics. However, topical streams have a tendency to further entrench topical silos. Researchers working to open up academia, for example, could almost certainly benefit from learning about the experiences of their colleagues in other fields and from teaching others about their area of expertise. Everyone could benefit from some facetime with a maker who builds cool, useful technology in their sleep! At OKFestival 2014 we want to ensure this type of knowledge sharing in order to offer everyone the chance to cross-collaborate in meaningful, impactful ways. We can all recognise that issues such as privacy, data protection and net neutrality affect all domains within the open space, and we want to ensure that these issues are addressed and worked through from a diversity of perspectives to produce truly global solutions. In order to build an impactful open coalition which can effect change around the world, we need to draw on and incorporate the experiences and knowledge of multiple local communities. Only by avoiding such topical silos and building a cross-topic network of understanding and collaboration can we inform inclusive and context-appropriate open practices. This year, we are mixing things up to achieve all of this and more! We are promoting cross-domain collaborations and urging you to collectively work through the complex problems that keep resurfacing. The individual sessions which are being submitted and proposed as we speak are pieces of this global puzzle, and this year’s Programme Team is responsible for putting that puzzle together. It’s a tough job, and we don’t want to do it alone, so if you want to start piecing it together before you submit your proposal, then collaborating with your colleagues who work in different spaces is a sure-fire way to create an interesting and attention-worthy session. We fully encourage you to reach out to those colleagues who you believe may hold a piece of your puzzle, and we’ve set up this mailing list for you to do just that. We understand that by mixing things up, questions are sure to arise. That is why we have put together this handy page with tips and tricks for organising your session, booted that aforementioned mailing list for session organisers to discuss their proposals and foster new collaborations, and even organised two hangouts (Friday and Monday – pick one!) to give you the opportunity to ask questions and be inspired. Finally, we need your help. We believe that at the heart of the open movement are values such as diversity and inclusivity. We need you to make sure that your OKFestival is as diverse and inclusive as possible, because as we all know, there’s so much more to learn that way. If you know awesome people who have something key to say about sharing knowledge, building amazing tools and stirring up society to make an impact, then send them our way. If that’s you, then what are you waiting for?! Start thinking about a collaborative, interactive and powerful session for OKFestival! Comments Off on OKFestival streams – concept and how to get help! The Open Knowledge Festival call for session proposals is now open! The better the proposals, the better the festival, so we’re inviting you to put on your thinking caps and come up with revolutionarily brilliant ideas for sessions at OKFestival 2014. We know you can do it, and we know you’ll make this festival a huge success by bringing your input to it. To help you fine-tune your ideas – and ask any burning questions that you may have – the Festival Programme Team are going to be on hand via online hangouts over the next week to give you some pointers. Hangouts will be held on Friday, March 7 at 21:00 GMT (22:00 CET/ 13:00 PST/ 16:00 EST) and on Monday, March 10, at 10:00 GMT (11:00 CET/ 13:00 EAT/ 18:00 HKT). We’ll be interacting with you live via etherpad and Twitter – #okfestsessions – as well as via the Google+ Hangouts Q&A App where you can post your questions on the day. The hangouts will be streamed direct to our YouTube channel and G+ page. If you can’t join us for whatever reason, don’t worry - the resultant YouTube videos will be archived so you can watch them later and you can also continue to read and contribute to the etherpad after the hangouts. We’re looking forward to building this year’s programme with you!